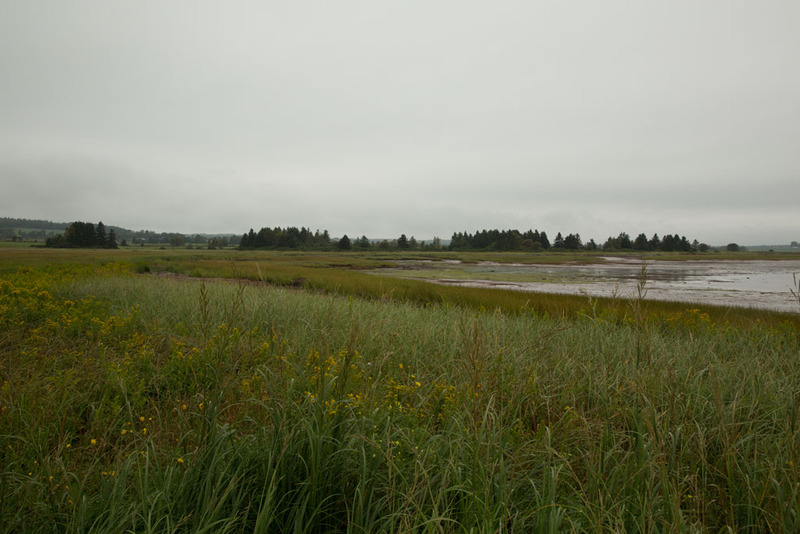 We have 3 days to explore Prince Edward Island (PEI) and while it is a small island, the roads aren’t the best, so short distances take some time to drive. Last night we reviewed the 3 circular drives on the island – East, Central and West. 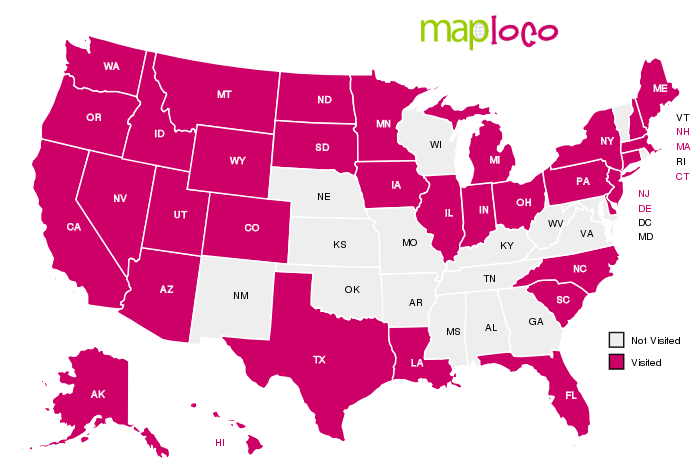 To complete the East drive is 245 miles or about 6 hours of driving, which doesn’t leave much time for stopping. Therefore our plan is 1 day in Charlottetown and 2 days on the central drive. After breakfast and walking the dogs, the sky was overcast and the prognosis for the immediate weather was not positive, but we are only here for a few days and the forecast in the afternoon was for improvement, so we headed out. The first stop was Victoria Harbour, a small fishing village on the south shore. As we parked the heavens opened. We parked on the pier and checked out the restaurant and shops. The first place we saw was a brewery/pub and restaurant, but unfortunately it was closed, so no chance of a hopped beverage to take the mind off the rain. Next up was a souvenir shop, which was the only one actually open. At the end was another restaurant and ice cream bar. 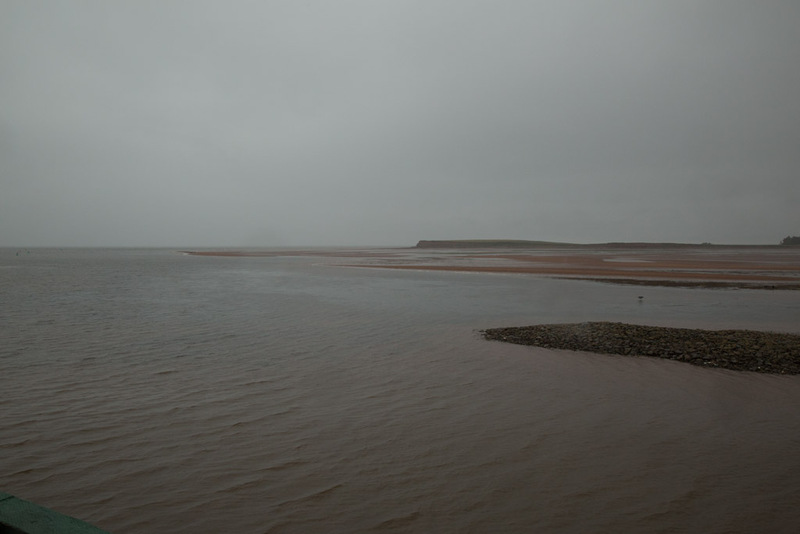 As the rain intensified, Judi headed back to the car while Andy braved the elements to capture a few quick photographs. 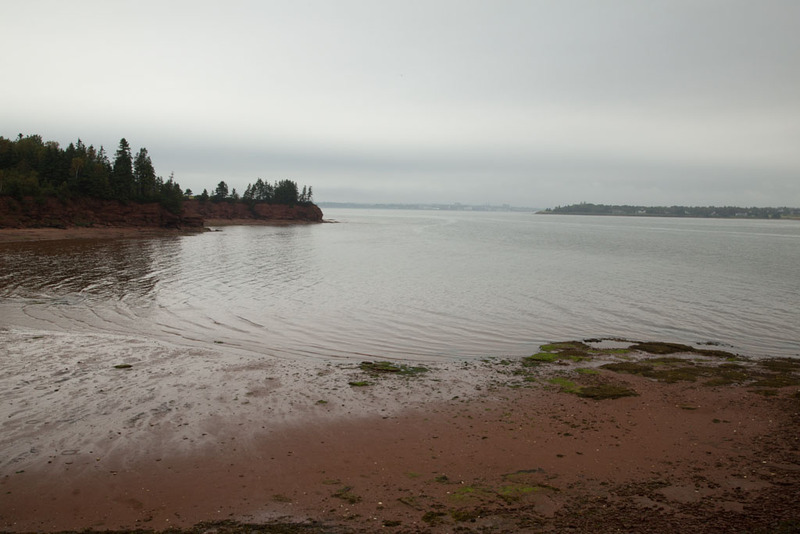 Unfortunately the rain didn’t provide much opportunity to get good photographs of the harbour approaches and red sand, which is common on PEI. The lighthouse, or range light is fully automated and is well maintained and surrounded by gardens. 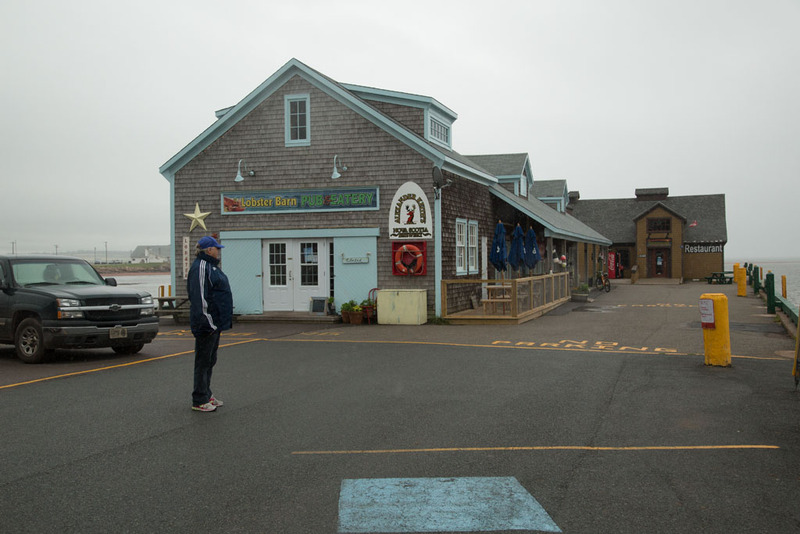 We had planned to walk around the village, but the inclement weather put paid to those plans, so back to the car and continue towards Charlottetown. Driving along Hwy 19 we found a side road that looked like it headed down to the beach, so we thought we would try it out. Bonus, the rain had stopped and yes, we were able to drive almost to the beach. We got the dogs out and let them have a run, while we enjoyed the scenery. Back on the road our next stop was Blockhouse Point, which is the Western headland at the entrance to Charlottetown Harbour. Established in 1851, unfortunately it appears the Canadian Coast Guard hasn’t maintained it since it was built, as the outside is in poor shape. The structure is a tapered square with adjoining 2 storey residence, with the light 56′ above sea level. The light was automated in July 1962. 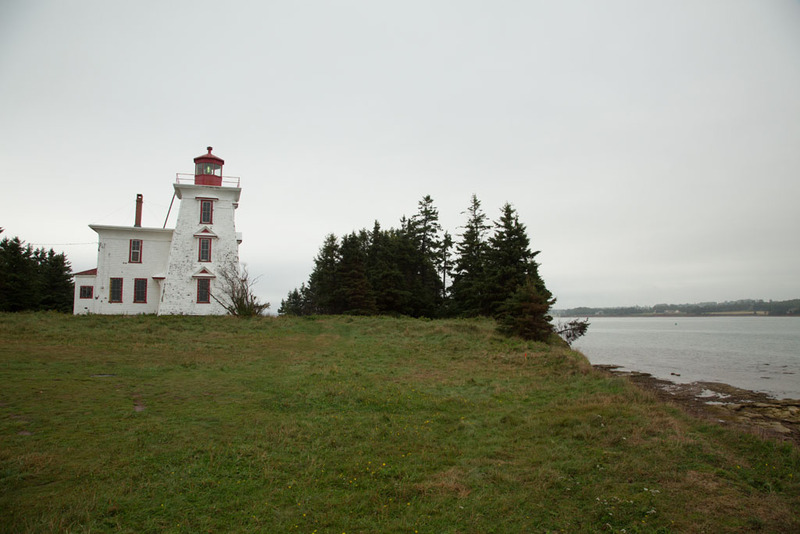 While the lighthouse is in disrepair, the headland does afford great views across the harbour entrance and down to Charlottetown. 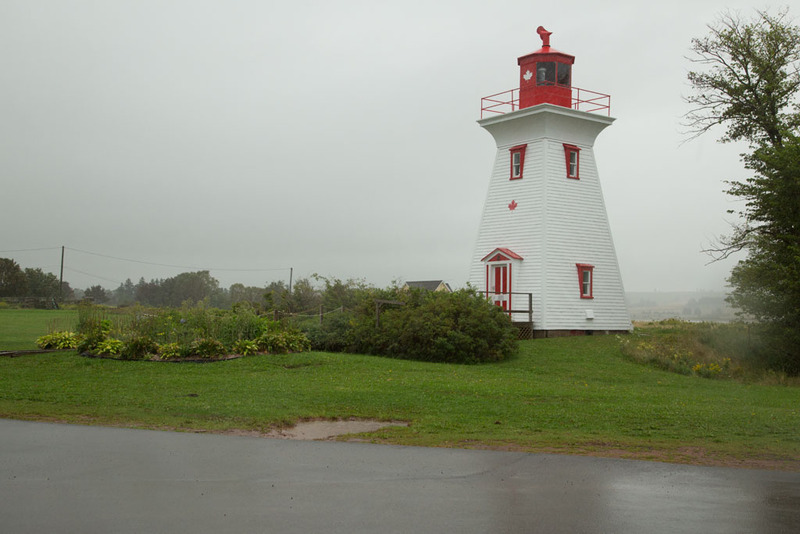 The mosquitos were really bad at the lighthouse, so it was a couple of quick photographs and straight back to the truck for the short trip to Fort Amherst, a National Historic Site. Frankly it is rather underwhelming, as it is only lawn, foot paths and a couple of displays with historical information on the Acadians. However, the view across and down the harbour were worth the visit. 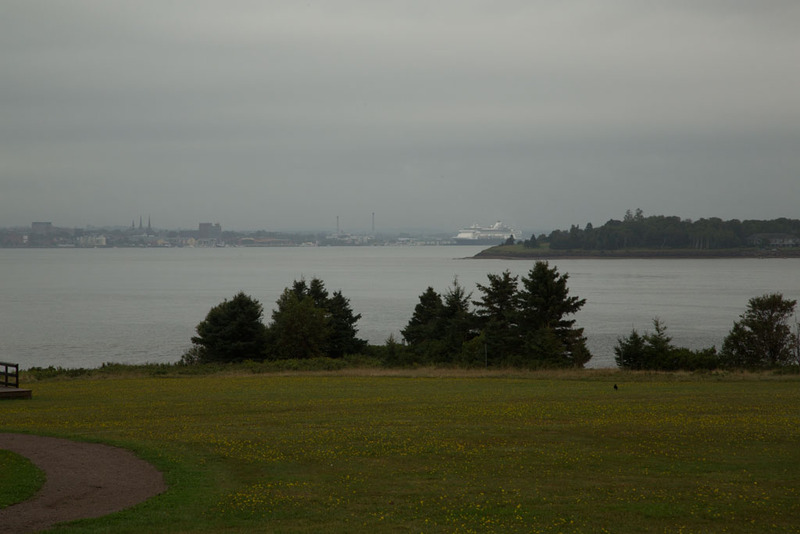 Looking down the harbour towards Charlottetown with the Holland America cruise ship Veendam docked. It was already 12:30 and we were starting to get the first pangs of hunger, so checked the GPS for restaurants, finding a few in the vicinity of Province House. 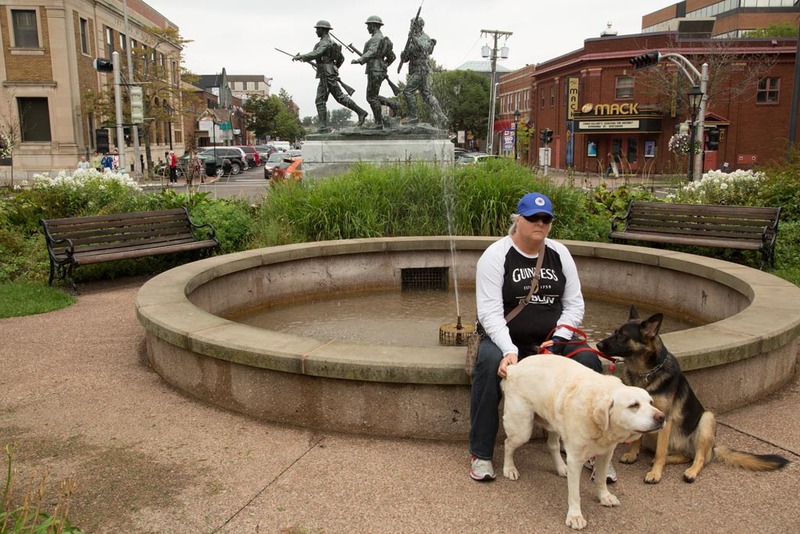 Driving through downtown Charlottetown we noted Global Pet Foods, so stopped in for a bag of dog food, since we were getting low. Ouch, $90 for what we buy at home for $75 or about $55 to $60 South of the border. Arriving in the vicinity of the restaurant area, we immediately noted parking would be an issue, as only on street parking was available and the spots weren’t overly generous, especially the couple of empty ones we spotted. About 2nd time around the block, finally we spotted a space we could get in, only problem we couldn’t reverse in, so the back end stuck way out in the traffic. Bonus, it still had almost 2 hrs on the meter, which appealed to Andy’s heritage. Across the street we saw an Irish Pub, figuring it should be safe we headed in for a pint and spot of lunch. Beers were the usual collection of Irish beers – Guinness, Smithwicks, Harp and a selection of mass produced yellow crap. They also had a local beer, which I sampled, but it was a lager. So after some thought it was Guinness, which was well poured, smooth and fresh. Fortunately, it was Tuesday, as the waitress mentioned pints of Guinness were on special at $5.00, with the regular price $9.00. Even a good pint of Guinness isn’t worth $9.00. We both had fish & chips – Andy deep fried and Judi pan fried. While the fish was fresh, the batter was way too thick and hadn’t cooked all the way through. Certainly not the best food we have eaten. After lunch it was back to playing tourist, with the first stop Province House, which is a Parks Canada National Historical Site. 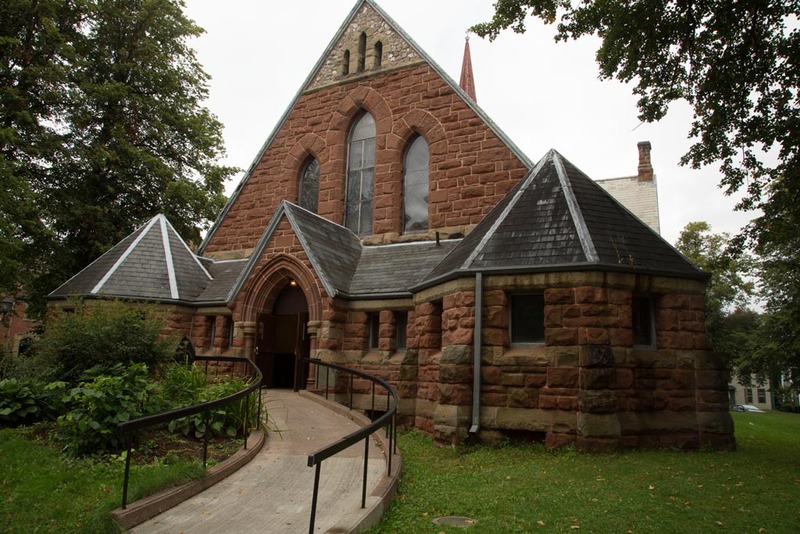 Since 1847, the building has housed the Prince Edward Island Legislator, which makes it the 2nd oldest in Canada. 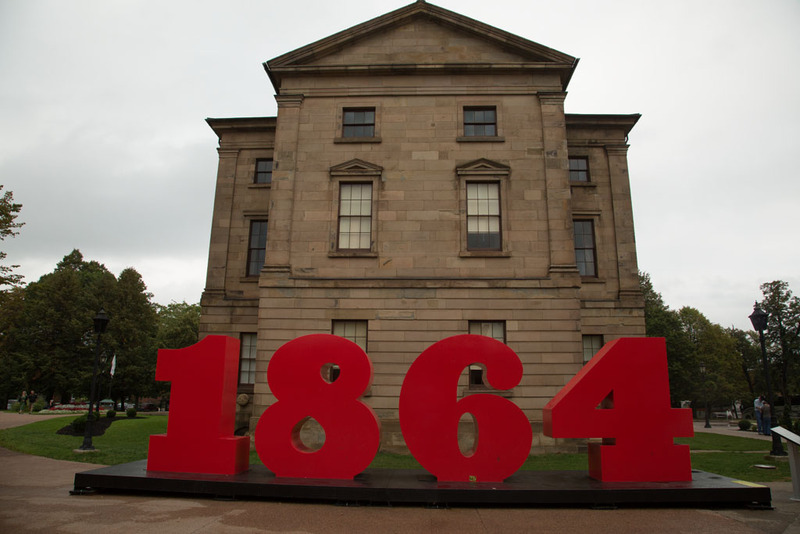 In 1846, from September 1st to 7th, Province House was the host location for the Charlottetown Conference meetings, which resulted in Confederation and the formation of Canada. 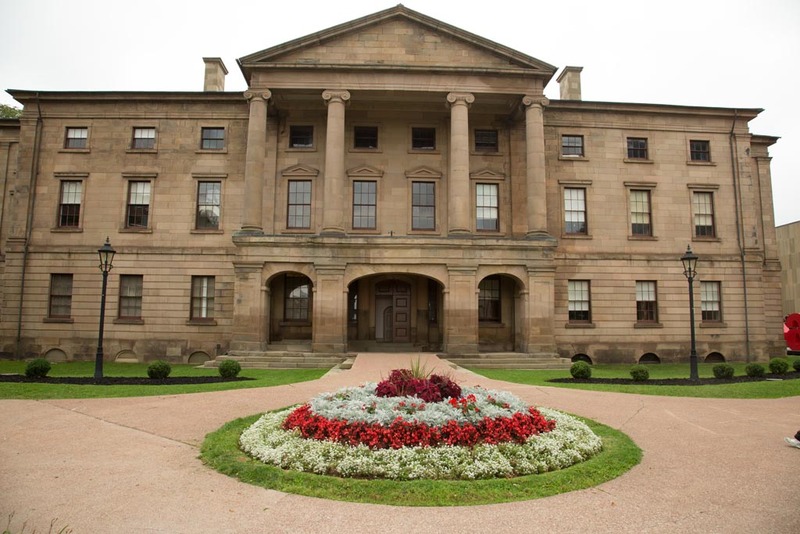 In 1973, Parks Canada approached PEI with a proposal to restore and jointly manage Province House, as both a functioning Legislator and National Historic Park. During the summer they have guides in period costumes both inside and outside, and guides tours are available, by donation. This is a definite place to visit for all Canadians. Next up was a couple of churches, the first being the catholic, which was spectacular on the outside, but Judi said the volunteers inside weren’t friendly or helpful. The Anglican Church wasn’t as impressive on the outside, but Judi was chatting to a volunteer on the inside, who was super friendly and very informative. He lived locally and had attended the church for his entire life. On return to the truck we decided to head back to the campground, stopping off at the Cows Creamery Factory for a tour and ice cream. The tour didn’t start for a while and they last 1/2 hr, so we gave up the idea of a tour and just tried a cone each. Wow, great tasting ice cream and smooth. 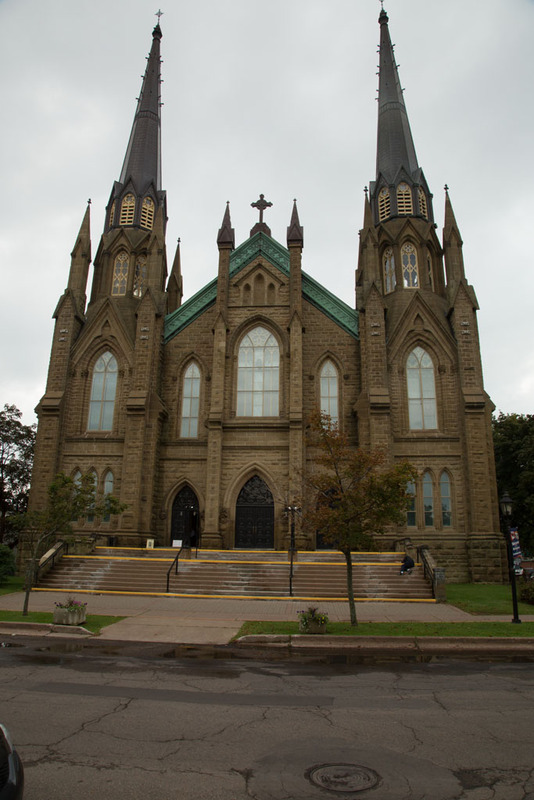 This entry was posted in Prince Edward Island and tagged Beer, Charlottetown, Church, Confederation, Lighthouse, Prince Edward Island, Province House by oriana77. Bookmark the permalink.